For much of its existence, Woodward Governor Co. has been building fuel nozzles and other parts for jet aircraft engines the old-fashioned way — carefully designing them, building physical prototypes out of raw materials, conducting tests and finally creating production parts. Typically, it took the Fort Collins, Colo., company weeks to produce workable plans for specialized new nozzle designs. Now, that time frame has been trimmed down to several hours by cutting out the steps needed to make physical prototypes. Instead, Woodward is using powerful cloud-based supercomputers that can run complex software to quickly create and evaluate designs that can go right into production. In other words, the nozzle designs can go from creation to production 80 per cent faster because the company no longer needs to first build models to prove the designs, a change that’s projected to save the company about a half-million dollars each year. “Woodward had some fairly robust computer workstations internally” to produce designs, but the company didn’t have anything powerful enough to run large simulations, says Robert Graybill, an HPC consultant who worked with Woodward to help add on-demand supercomputer power to the company’s production capabilities. Woodward’s pilot project lasted 10 weeks, and additional testing will continue through October, followed by reviews of the project to determine if and how Woodward might use on-demand supercomputing in the future. Dan Olds, an analyst at Gabriel Consulting Group Inc. in Beaverton, Ore., says on-demand supercomputing is an idea that’s blossoming. It’s particularly useful for businesses that sometimes need processing help but can’t afford to buy their own full-time, on-site HPC equipment. “And it really opens the door for other users where this isn’t even on their horizon yet,” Olds says. “They could do these things on their own with the modest equipment they have, but it literally could take years.” Alternately, users could simplify the problems they’re trying to solve so their projects could run on systems they can afford, “but that might not give them the results they need,” Olds says. On-demand supercomputing helps companies avoid both those compromises without breaking their budgets. The market for such services has been fairly limited in the past, said Charles King, principal analyst at Pund-IT Inc. in Hayward, Calif. “But a weak, rocky economy makes on-demand services a lot more affordable and attractive than purchasing and maintaining a dedicated supercomputing cluster,” he said in an e-mail. The biggest challenges are more likely related to software than hardware, King says. Many companies that use HPC systems have developed their own applications or have tweaked packaged applications for their own use. So how providers of on-demand supercomputing services work with customers to run their existing software is a key issue. For its part, Woodward got started with on-demand supercomputing when it was invited to participate in a pilot project through the University of Southern California’s Information Sciences Institute (ISI), where Graybill is the director of innovation. The goal was to explore how manufacturers could use HPC cloud computing services to improve their industrial design and modeling processes. The work was done under a $3.67 million contract from the Defense Advanced Research Projects Agency (DARPA). Woodward began accessing HPC services through an IBM Computing On Demand facility in Poughkeepsie, N.Y. It’s a cluster of 256 System x3550 servers and 128 System x3450 servers with a total of 16GB of RAM, providing more than 19 trillion floating point operations per second (TFLOPS) of sustained performance, according to IBM. Woodward is able to use the extra computing power as needed, Graybill says. The Woodward pilot project was one of four similar projects that DARPA funded in the past couple of years. The three other projects involved virtual metal forming for ACE Clearwater Enterprises in Torrance, Calif., chassis weight reduction for AlphaSTAR Corp. of Long Beach, Calif., and electromagnetic interference signature analysis for AltaSim Technologies Inc. of Columbus, Ohio. To date, the extra computing horsepower is helping Woodward produce new jet engine nozzle designs much more efficiently, while also reducing waste materials by 50 per cent, according to figures from the pilot project. Costs were reduced by $275,000 per engineer annually by using supercomputers to eliminate the need for physical modeling, saving more than $500,000 per year, the study concluded. And because it’s able to buy the HPC time only when needed, Woodward doesn’t have to deploy expensive on-site HPC clusters, which would bring additional energy costs and require maintenance by additional IT administrators, he explains. Similar kinds of public-private HPC projects have been undertaken through the Ohio Supercomputing Center (OSC), where businesses based in that state can get both computing capacity and expert advice to help improve their bottom lines. “We have been helping with building economic development in Ohio, giving businesses from large to small access to supercomputing,” says Ashok Krishnamurthy, the interim co-director of the center, which is based in Columbus. More than 25 businesses have directly participated in OSC’s Blue Collar Computing program, which provides supercomputing power to companies that typically hadn’t considered using it previously. More than 250 smaller companies have also used the services by accessing them through related organizations such as the Edison Welding Institute (EWI), he says. 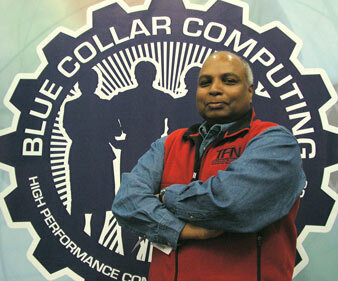 Ashok Krishnamurthy says the Ohio Supercomputing Center’s “Blue Collar Computing” initiative has given hundreds of small Ohio companies access to supercomputing power. Typical workstations couldn’t handle all of the calculations that are involved in this process, he says. Chris Conrardy, CTO at Edison Welding Institute, says around 100 companies used a supercomputer-based service in the first month it was available to help them figure out the best way to weld specific products. Around 100 EWI member companies used the E-Weld Predictor in its first month, Conrardy says. The E-Weld Predictor harnesses the OSC’s 1,650-node IBM Glenn 1350 supercomputer. The Glenn 1350 runs AMD Opteron multicore processors and IBM cell processors and offers a peak performance of more than 75 TFLOPS, according to OSC. The OSC is also working with DARPA, Krishnamurthy says, to help smaller companies that are providing parts and equipment through the U.S. Department of Defense supply chain. One example is a defense components manufacturer, which cannot be named because of security concerns, that designs power control units for the U.S. Navy, says Krishnamurthy. Often the vendor couldn’t meet strict bid specifications because it didn’t have the resources to do component testing, so it would request waivers for such testing, he says. The OSC and one of its partners, AltaSim Technologies, helped by showing the defense contractor how it could simulate the performance and construction of very large power control units using offsite supercomputing power. The OSC’s assistance helped the company save up to $1 million in the development of prototype power units, says Jeffrey Crompton, principal at AltaSim. The supercomputer simulation work will potentially save even more if the parts eventually go into production — as much as $100 million or more in savings over traditional testing, prototyping and manufacturing, he explains. Graybill says he gives Amazon.com Inc. the bulk of the credit for creating the on-demand computing marketplace. In 2006, Amazon began offering cloud-based computing services to businesses that needed additional IT resources. The online retailer originally set up its Elastic Compute Cloud 2 (EC2) on-demand computing service as a way to utilize and monetize its internal IT infrastructure outside of peak holiday shopping periods, Graybill says. “They had [that huge infrastructure] to manage the loads on their busiest days, so they had spare cycles to sell at other times. That started this revolution, in my opinion,” he says. But while Amazon tapped into a need among businesses that never before had such easy access to externally managed IT resources, the retailer’s offering is not necessarily the same thing as on-demand high-performance computing. Specialized HPC systems like those from SGI and IBM offer better and faster interconnects between processor nodes and memory, which means they are capable of dramatically superior performance than the more general computing architectures offered by Amazon and others, Graybill explains. “Not to pick on Amazon, but these are different systems for different needs,” he says. That said, Amazon recently added more sophisticated monitoring tools and improved integration with traditional data centers for services like connecting an internal cloud with Amazon’s offerings. Perhaps your company needs high-performance computing (HPC) power to speed up its design or production processes, but you’re not able to make the financial commitment for the expensive hardware, additional power and cooling, and dedicated IT administrators needed to run it all. If so, here are some options in the growing pay-for-what-you-need supercomputing market. SGI: In February, Silicon Graphics International Corp. launched an on-demand, cloud-based HPC service called Cyclone. It’s designed for companies that need extra computing power to run technical applications. “In the first week of the announcement, we had 15 calls from companies on three continents” with inquiries about Cyclone, says Christian Tanasescu, SGI’s vice president of software engineering. “Certainly this is our plan — to help companies bring in supercomputing capabilities, of lowering the barriers for this kind of computing.” Cyclone marks the first time that SGI, a server manufacturer, is offering IT services, Tanasescu says. The Fremont, Calif.-based vendor has signed on some customers in the academic market so far, but no further details are being released, according to an SGI spokesman. HP: Hewlett-Packard Co. is testing a public HPC cloud with Intel Corp., Yahoo Inc. and several academic organizations, according to Ed Turkel, HP’s manager of business development for scalable computing and infrastructure. The project, which includes the company’s HP Labs division, consists of open-source research with connected supercomputers from all the participants, he says. The project, called OpenCirrus.org, is available now for companies that want to access it and experiment with it. The amount of computing power from each of the participating groups varies, but each contributes access to more than 1,000 processor cores. The total computing power of about 16,017 CPU cores is presently available through the cloud test bed. The project is still under development and no details were available on when or if it would ever be available for use by paying customers. IBM: Herb Schultz, IBM’s deep computing manager, says that the company had predicted that a market for on-demand HPC services would materialize and started preparing the necessary systems about five years ago. Customers who want to buy on-demand supercomputing services from IBM can register online and then access the services through a secure, Web-based system. Users can upload data or run their executables as needed. IBM can isolate a given customer’s data and put a wall around it so there are no security issues, Schultz explains. One caveat about supercomputing in the cloud is that user companies need to be absolutely sure that their proprietary data will be stored, run and analyzed securely by HPC vendors, says Dan Olds, an analyst at Gabriel Consulting Group. To accomplish that, customers need to be upfront about their data protection needs and ask their vendors questions to ensure that their data is handled with the security that they require, he says. Todd R. Weiss, an award-winning former Computerworld reporter, is a freelance writer covering technology news, cool tech gear, CRM, ERP and more.